‘Rapunzel, let down your hair.’ Children will be enchanted by the story of the girl who was locked in a tower by an evil witch and who escapes thanks to her long tresses. The Toniebox makes it easy for today’s children to listen to stories that were once popular as audiobooks on record players and cassette recorders. 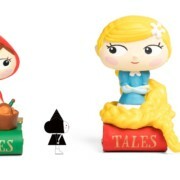 All they have to do is place the small Rapunzel or one of the many other figures on the soft, cube-shaped speaker – and the story will unfold. From cleansing foam with activated charcoal through to anti-ageing pads with bee venom: the limited-edition At Home Facial Mask Set contains five different masks that can be whipped out like business cards whenever skincare issues arise. Their combined power can also be harnessed in a single comprehensive treatment – for all those seeking complete well-being. As the world’s most famous perfume, it needs no introduction. 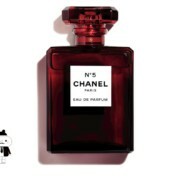 Anyone who recalls the memorable Chanel adverts will even associate a particular colour palette with N°5: Carole Bouquet’s crimson dress in the 80s, Estella Warren’s Little Red Riding Hood cloak in the 90s and the ruby-red carpet over which Nicole Kidman glided in 2004. 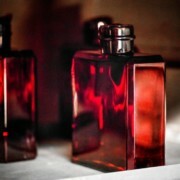 This winter, the fragrance glistens in a dark-red bottle in crystal glass, thus continuing this iconic tradition. Rosebuds in the gardens of Grasse, undergrowth on a woodland walk, the warm island sun and snowflakes falling before your eyes – the four new Louis Vuitton scented candles each capture a moment in time. As parfumier Jacques Cavallier Belletrud continues to expand the fashion house’s portfolio of fragrances, the leather handles of the scented candles remain true to the material for which the brand is most famous. Masala chai is a beverage from the Indian subcontinent in which black tea leaves, cardamom and other spices are brewed in hot milk. Fragrance composer Ben Gorham has created a scented candle based on this invigorating blend, drawing on his memory of how the aroma would waft through the house of his Indian grandmother. 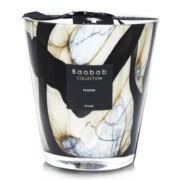 The scented candles of the Baobab Collection are sophisticated decorative objects made of handblown glass. They are as eye-catching as the solitary trees of the African savannah from which they take their name. The textured opaque/transparent pattern on the models of the limited-edition winter collection is reminiscent of the stones marble, agate and lapis lazuli. Anyone travelling over the holidays, or who knows what it’s like to live out of a suitcase, will appreciate having the essential items for their daily skincare ritual in a compact set. The Oskia set contains a day cream, a cleansing gel, a mask and two other popular products from this London brand in a handy, travel-sized format. 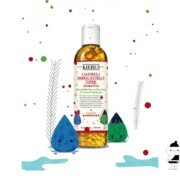 Jeff Koons, Kate Moross and other artists have already had the pleasure of designing special-edition care products for Kiehl’s. This season, the honour falls to American artist Andrew Bannecker. ‘Playfully elegant’ is how the brand describes the graphic style of its creative partner, who has designed products such as creams, toners and soaps. 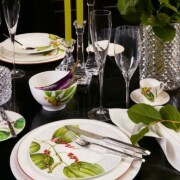 Scandinavian design is famed for its clear lines. 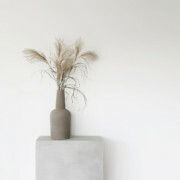 The bookends, terracotta vases and similarly sophisticated interior objects from Kristina Dam Studio in Copenhagen are prime examples. The eponymous founder takes her inspiration from the Bauhaus movement and her travels. The timeless character of her minimalist designs comes courtesy of a monochrome colour palette, coupled with the frequent use of natural materials. With By Lassen, Søren Lassen is building on the geometric forms characteristic of his ancestors Mogens and Flemming Lassen. This duo of architects and designers were two of the most prominent exponents of the Danish modern style. The treasure trove of sketches that they left behind is a rich source of inspiration for distinctive furniture and fittings. A classic design is the lacquered metal cube from 1962, which serves as a candleholder. These days, even the more traditional among us are fairly relaxed about the fact that a family is not necessarily always made up of mum, dad and children. The term ‘Friendsmas’ refers to a desire (not just limited to the US) to spend Christmas in the company of friends and other chosen ones. So far, this has meant a cosy gathering with festive biscuits and mulled wine – only for the usual tribe to then congregate around the Christmas tree. Is it time to extend the Friendsmas idea to the day itself? How about bringing your family and your best friends together? Perhaps a few Christmas romances might be struck up beneath the mistletoe (who would have thought that my Aunty Sarah and your Uncle Harry would get along so well?). We don’t talk about ‘family ties’ for nothing, so Christmas offers a chance to stretch those ties beyond blood relatives.